Copyright © 2009-2018 Andrew Beekhof. This document provides a step-by-step guide to building a simple high-availability cluster using Pacemaker. Given the graphical nature of the install process, a number of screenshots are included. However the guide is primarily composed of commands, the reasons for executing them and their expected outputs. While this guide is part of the document set for Pacemaker 2.0, it demonstrates the version available in the standard CentOS repositories. In PDF and paper editions, this manual uses typefaces drawn from the Liberation Fonts set. The Liberation Fonts set is also used in HTML editions if the set is installed on your system. If not, alternative but equivalent typefaces are displayed. Note: Red Hat Enterprise Linux 5 and later include the Liberation Fonts set by default. The above includes a file name, a shell command and a key, all presented in mono-spaced bold and all distinguishable thanks to context. Press Ctrl+Alt+F2 to switch to a virtual terminal. The first example highlights a particular key to press. The second example highlights a key combination: a set of three keys pressed simultaneously. Choose System → Preferences → Mouse from the main menu bar to launch Mouse Preferences. In the Buttons tab, select the Left-handed mouse check box and click Close to switch the primary mouse button from the left to the right (making the mouse suitable for use in the left hand). If you find a typographical error in this manual, or if you have thought of a way to make this manual better, we would love to hear from you! Please submit a report in Bugzilla against the product Pacemaker. Computer clusters can be used to provide highly available services or resources. The redundancy of multiple machines is used to guard against failures of many types. This document will walk through the installation and setup of simple clusters using the CentOS distribution, version 7.5. The clusters described here will use Pacemaker and Corosync to provide resource management and messaging. Required packages and modifications to their configuration files are described along with the use of the Pacemaker command line tool for generating the XML used for cluster control. Pacemaker is a central component and provides the resource management required in these systems. This management includes detecting and recovering from the failure of various nodes, resources and services under its control. When more in-depth information is required, and for real-world usage, please refer to the Pacemaker Explained manual. Pacemaker is a high-availability cluster resource manager — software that runs on a set of hosts (a cluster of nodes) in order to preserve integrity and minimize downtime of desired services (resources). It is maintained by the ClusterLabs community. Fencing, also known as STONITH (an acronym for Shoot The Other Node In The Head), is the ability to ensure that it is not possible for a node to be running a service. This is accomplished via fence devices such as intelligent power switches that cut power to the target, or intelligent network switches that cut the target’s access to the local network. Pacemaker represents fence devices as a special class of resource. A cluster cannot safely recover from certain failure conditions, such as an unresponsive node, without fencing. Resources: These are the reason for the cluster’s being — the services that need to be kept highly available. Resource agents: These are scripts or operating system components that start, stop, and monitor resources, given a set of resource parameters. These provide a uniform interface between Pacemaker and the managed services. Fence agents: These are scripts that execute node fencing actions, given a target and fence device parameters. Cluster membership layer: This component provides reliable messaging, membership, and quorum information about the cluster. Currently, Pacemaker supports Corosync as this layer. Cluster resource manager: Pacemaker provides the brain that processes and reacts to events that occur in the cluster. These events may include nodes joining or leaving the cluster; resource events caused by failures, maintenance, or scheduled activities; and other administrative actions. To achieve the desired availability, Pacemaker may start and stop resources and fence nodes. Cluster tools: These provide an interface for users to interact with the cluster. Various command-line and graphical (GUI) interfaces are available. Most managed services are not, themselves, cluster-aware. However, many popular open-source cluster filesystems make use of a common Distributed Lock Manager (DLM), which makes direct use of Corosync for its messaging and membership capabilities and Pacemaker for the ability to fence nodes. The Pacemaker master process (pacemakerd) spawns all the other daemons, and respawns them if they unexpectedly exit. The Cluster Information Base (CIB) is an XML representation of the cluster’s configuration and the state of all nodes and resources. The CIB manager (pacemaker-based) keeps the CIB synchronized across the cluster, and handles requests to modify it. The attribute manager (pacemaker-attrd) maintains a database of attributes for all nodes, keeps it synchronized across the cluster, and handles requests to modify them. These attributes are usually recorded in the CIB. Given a snapshot of the CIB as input, the scheduler (pacemaker-schedulerd) determines what actions are necessary to achieve the desired state of the cluster. The local executor (pacemaker-execd) handles requests to execute resource agents on the local cluster node, and returns the result. The fencer (pacemaker-fenced) handles requests to fence nodes. Given a target node, the fencer decides which cluster node(s) should execute which fencing device(s), and calls the necessary fencing agents (either directly, or via requests to the fencer peers on other nodes), and returns the result. 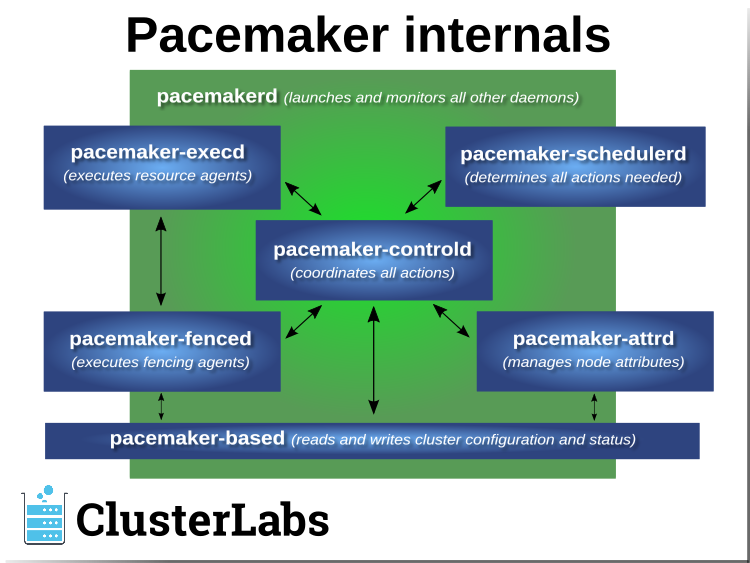 The controller (pacemaker-controld) is Pacemaker’s coordinator, maintaining a consistent view of the cluster membership and orchestrating all the other components. Pacemaker centralizes cluster decision-making by electing one of the controller instances as the Designated Controller (DC). Should the elected DC process (or the node it is on) fail, a new one is quickly established. The DC responds to cluster events by taking a current snapshot of the CIB, feeding it to the scheduler, then asking the executors (either directly on the local node, or via requests to controller peers on other nodes) and the fencer to execute any necessary actions. The Pacemaker daemons were renamed in version 2.0. You may still find references to the old names, especially in documentation targeted to version 1.1. Pacemaker supports practically any node redundancy configuration including Active/Active, Active/Passive, N+1, N+M, N-to-1 and N-to-N.
Active/passive clusters with two (or more) nodes using Pacemaker and DRBD are a cost-effective high-availability solution for many situations. One of the nodes provides the desired services, and if it fails, the other node takes over. 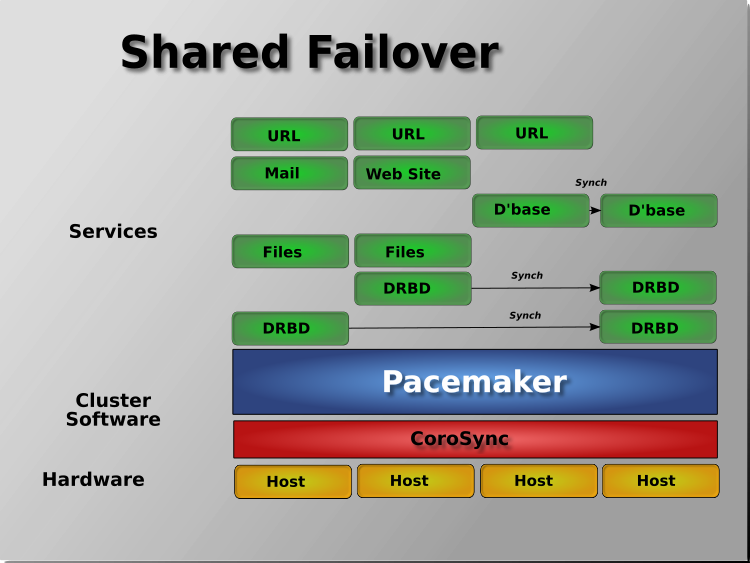 Pacemaker also supports multiple nodes in a shared-failover design, reducing hardware costs by allowing several active/passive clusters to be combined and share a common backup node. When shared storage is available, every node can potentially be used for failover. Pacemaker can even run multiple copies of services to spread out the workload. Cluster is sometimes used in other contexts to refer to hosts grouped together for other purposes, such as high-performance computing (HPC), but Pacemaker is not intended for those purposes. Download the 4GB CentOS 7.5 DVD ISO. Use the image to boot a virtual machine, or burn it to a DVD or USB drive and boot a physical server from that. 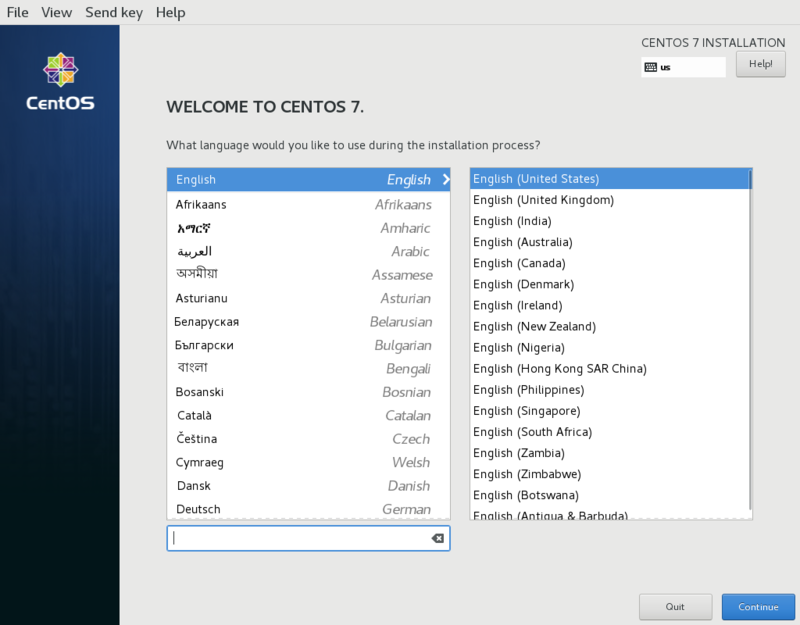 After starting the installation, select your language and keyboard layout at the welcome screen. At this point, you get a chance to tweak the default installation options. Ignore the SOFTWARE SELECTION section (try saying that 10 times quickly). The Infrastructure Server environment does have add-ons with much of the software we need, but we will leave it as a Minimal Install here, so that we can see exactly what software is required later. Edit Host Name: as desired. For this example, we will use pcmk-1.localdomain. Select your network device, press Configure…, and manually assign a fixed IP address. For this example, we’ll use 192.168.122.101 under IPv4 Settings (with an appropriate netmask, gateway and DNS server). Flip the switch to turn your network device on, and press Done. Do not accept the default network settings. Cluster machines should never obtain an IP address via DHCP, because DHCP’s periodic address renewal will interfere with corosync. By default, the installer’s automatic partitioning will use LVM (which allows us to dynamically change the amount of space allocated to a given partition). However, it allocates all free space to the / (aka. root) partition, which cannot be reduced in size later (dynamic increases are fine). In order to follow the DRBD and GFS2 portions of this guide, we need to reserve space on each machine for a replicated volume. Enter the INSTALLATION DESTINATION section, ensure the hard drive you want to install to is selected, select I will configure partitioning, and press Done. In the MANUAL PARTITIONING screen that comes next, click the option to create mountpoints automatically. Select the / mountpoint, and reduce the desired capacity by 1GiB or so. Select Modify… by the volume group name, and change the Size policy: to As large as possible, to make the reclaimed space available inside the LVM volume group. We’ll add the additional volume later. Press Done, then Accept changes. It is highly recommended to enable NTP on your cluster nodes. Doing so ensures all nodes agree on the current time and makes reading log files significantly easier. CentOS will enable NTP automatically. If you want to change any time-related settings (such as time zone or NTP server), you can do this in the TIME & DATE section. Select Begin Installation. Once it completes, set a root password, and reboot as instructed. For the purposes of this document, it is not necessary to create any additional users. After the node reboots, you’ll see a login prompt on the console. Login using root and the password you created earlier. From here on, we’re going to be working exclusively from the terminal. Ensure that the machine has the static IP address you configured earlier. This makes NetworkManager aware that a change was made on the config file. to the device configuration using the same process as described above for changing the IP address. Now, check for connectivity to the outside world. Start small by testing whether we can reach the gateway we configured. PING 192.168.122.1 (192.168.122.1) 56(84) bytes of data. Now try something external; choose a location you know should be available. PING oss-uk-1.clusterlabs.org (109.74.197.241) 56(84) bytes of data. The console isn’t a very friendly place to work from, so we will now switch to accessing the machine remotely via SSH where we can use copy and paste, etc. PING 192.168.122.101 (192.168.122.101) 56(84) bytes of data. Next, login as root via SSH. The authenticity of host '192.168.122.101 (192.168.122.101)' can't be established. ECDSA key fingerprint is 6e:b7:8f:e2:4c:94:43:54:a8:53:cc:20:0f:29:a4:e0. Warning: Permanently added '192.168.122.101' (ECDSA) to the list of known hosts. You may want to reboot to ensure all updates take effect. Repeat the Installation steps so far, so that you have two nodes ready to have the cluster software installed. For the purposes of this document, the additional node is called pcmk-2 with address 192.168.122.102. PING 192.168.122.102 (192.168.122.102) 56(84) bytes of data. PING pcmk-2.clusterlabs.org (192.168.122.101) 56(84) bytes of data. SSH is a convenient and secure way to copy files and perform commands remotely. For the purposes of this guide, we will create a key without a password (using the -N option) so that we can perform remote actions without being prompted. Unprotected SSH keys (those without a password) are not recommended for servers exposed to the outside world. We use them here only to simplify the demo. [root@pcmk-1 ~]# ssh-keygen -t dsa -f ~/.ssh/id_dsa -N ""
The authenticity of host 'pcmk-2 (192.168.122.102)' can't be established. ECDSA key fingerprint is SHA256:63xNPkPYq98rYznf3T9QYJAzlaGiAsSgFVNHOZjPWqc. ECDSA key fingerprint is MD5:d9:bf:6e:32:88:be:47:3d:96:f1:96:27:65:05:0b:c3. Warning: Permanently added 'pcmk-2,192.168.122.102' (ECDSA) to the list of known hosts. This document will show commands that need to be executed on both nodes with a simple # prompt. Be sure to run them on each node individually. This document uses pcs for cluster management. Other alternatives, such as crmsh, are available, but their syntax will differ from the examples used here. Before the cluster can be configured, the pcs daemon must be started and enabled to start at boot time on each node. This daemon works with the pcs command-line interface to manage synchronizing the corosync configuration across all nodes in the cluster. Created symlink from /etc/systemd/system/multi-user.target.wants/pcsd.service to /usr/lib/systemd/system/pcsd.service. The installed packages will create a hacluster user with a disabled password. While this is fine for running pcs commands locally, the account needs a login password in order to perform such tasks as syncing the corosync configuration, or starting and stopping the cluster on other nodes. If you received an authorization error for either of those commands, make sure you configured the hacluster user account on each node with the same password. If you are not using pcs for cluster administration, follow whatever procedures are appropriate for your tools to create a corosync.conf and copy it to all nodes. The final corosync.conf configuration on each node should look something like the sample in Appendix B, Sample Corosync Configuration. For some subtle issues, see Topics in High-Performance Messaging: Multicast Address Assignment or the more detailed treatment in Cisco’s Guidelines for Enterprise IP Multicast Address Allocation. In the dark past, configuring Pacemaker required the administrator to read and write XML. In true UNIX style, there were also a number of different commands that specialized in different aspects of querying and updating the cluster. All of that has been greatly simplified with the creation of unified command-line shells (and GUIs) that hide all the messy XML scaffolding. These shells take all the individual aspects required for managing and configuring a cluster, and pack them into one simple-to-use command line tool. They even allow you to queue up several changes at once and commit them all at once. Two popular command-line shells are pcs and crmsh. Clusters from Scratch is based on pcs because it comes with CentOS, but both have similar functionality. Choosing a shell or GUI is a matter of personal preference and what comes with (and perhaps is supported by) your choice of operating system. Start by taking some time to familiarize yourself with what pcs can do. Control and configure pacemaker and corosync. -h, --help         Display usage and exit. -f file            Perform actions on file instead of active CIB. --debug            Print all network traffic and external commands run. strongly discouraged unless you know what you are doing. cluster     Configure cluster options and nodes. acl         Manage pacemaker access control lists. qdevice     Manage quorum device provider on the local host. quorum      Manage cluster quorum settings. booth       Manage booth (cluster ticket manager). config      View and manage cluster configuration. As you can see, the different aspects of cluster management are separated into categories. To discover the functionality available in each of these categories, one can issue the command pcs category help. Below is an example of all the options available under the status category. more details, --hide-inactive hides inactive resources). is specified, only show active resources. View currently configured groups and their resources. View current membership information as seen by corosync. only information about the specified cluster will be displayed. configured in the local cluster if no nodes are specified. View xml version of status (output from crm_mon -r -1 -X). Now that corosync is configured, it is time to start the cluster. The command below will start corosync and pacemaker on both nodes in the cluster. If you are issuing the start command from a different node than the one you ran the pcs cluster auth command on earlier, you must authenticate on the current node you are logged into before you will be allowed to start the cluster. In this example, we are not enabling the corosync and pacemaker services to start at boot. If a cluster node fails or is rebooted, you will need to run pcs cluster start nodename (or --all) to start the cluster on it. While you could enable the services to start at boot, requiring a manual start of cluster services gives you the opportunity to do a post-mortem investigation of a node failure before returning it to the cluster. We can see here that everything appears normal with our fixed IP address (not a 127.0.0.x loopback address) listed as the id, and no faults for the status. If you see something different, you might want to start by checking the node’s network, firewall and SELinux configurations. You should see both nodes have joined the cluster. Other operating systems may report startup errors in other locations, for example /var/log/messages. Repeat these checks on the other node. The results should be the same. 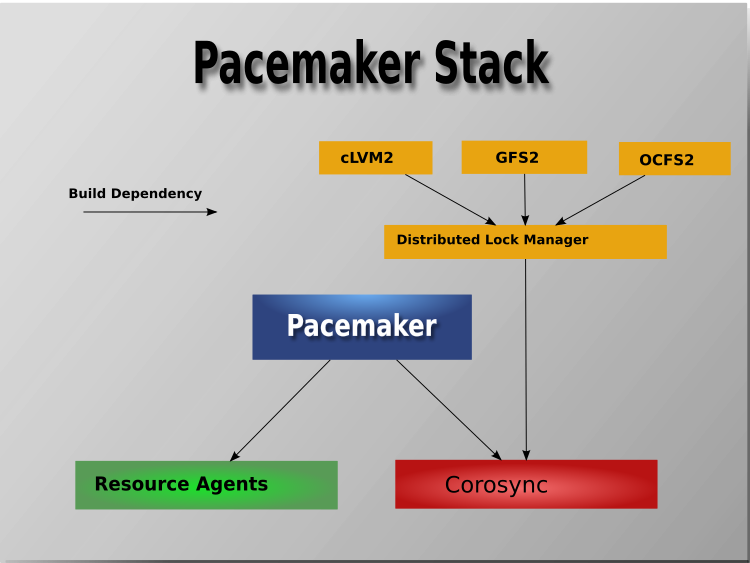 When Pacemaker starts up, it automatically records the number and details of the nodes in the cluster, as well as which stack is being used and the version of Pacemaker being used. For those who are not of afraid of XML, you can see the raw cluster configuration and status by using the pcs cluster cib command. Before we make any changes, it’s a good idea to check the validity of the configuration. As you can see, the tool has found some errors. In order to guarantee the safety of your data,  fencing (also called STONITH) is enabled by default. However, it also knows when no STONITH configuration has been supplied and reports this as a problem (since the cluster will not be able to make progress if a situation requiring node fencing arises). We will disable this feature for now and configure it later. With the new cluster option set, the configuration is now valid. The use of stonith-enabled=false is completely inappropriate for a production cluster. It tells the cluster to simply pretend that failed nodes are safely powered off. Some vendors will refuse to support clusters that have STONITH disabled. We disable STONITH here only to defer the discussion of its configuration, which can differ widely from one installation to the next. See Section 8.1, “What is STONITH?” for information on why STONITH is important and details on how to configure it. Our first resource will be a unique IP address that the cluster can bring up on either node. Regardless of where any cluster service(s) are running, end users need a consistent address to contact them on. Here, I will choose 192.168.122.120 as the floating address, give it the imaginative name ClusterIP and tell the cluster to check whether it is running every 30 seconds. The chosen address must not already be in use on the network. Do not reuse an IP address one of the nodes already has configured. The first field (ocf in this case) is the standard to which the resource script conforms and where to find it. The second field (heartbeat in this case) is standard-specific; for OCF resources, it tells the cluster which OCF namespace the resource script is in. The third field (IPaddr2 in this case) is the name of the resource script. Since our ultimate goal is high availability, we should test failover of our new resource before moving on. First, find the node on which the IP address is running. You can see that the status of the ClusterIP resource is Started on a particular node (in this example, pcmk-1). Shut down Pacemaker and Corosync on that machine to trigger a failover. A cluster command such as pcs cluster stop nodename can be run from any node in the cluster, not just the affected node. Go to the other node, and check the cluster status. Notice that pcmk-1 is OFFLINE for cluster purposes (its pcsd is still active, allowing it to receive pcs commands, but it is not participating in the cluster). Also notice that ClusterIP is now running on pcmk-2 — failover happened automatically, and no errors are reported. If a cluster splits into two (or more) groups of nodes that can no longer communicate with each other (aka. partitions), quorum is used to prevent resources from starting on more nodes than desired, which would risk data corruption. For example, if a 5-node cluster split into 3- and 2-node paritions, the 3-node partition would have quorum and could continue serving resources. If a 6-node cluster split into two 3-node partitions, neither partition would have quorum; pacemaker’s default behavior in such cases is to stop all resources, in order to prevent data corruption. Two-node clusters are a special case. By the above definition, a two-node cluster would only have quorum when both nodes are running. This would make the creation of a two-node cluster pointless, but corosync has the ability to treat two-node clusters as if only one node is required for quorum. The pcs cluster setup command will automatically configure two_node: 1 in corosync.conf, so a two-node cluster will "just work". If you are using a different cluster shell, you will have to configure corosync.conf appropriately yourself. In most circumstances, it is highly desirable to prevent healthy resources from being moved around the cluster. Moving resources almost always requires a period of downtime. For complex services such as databases, this period can be quite long. To address this, Pacemaker has the concept of resource stickiness, which controls how strongly a service prefers to stay running where it is. You may like to think of it as the "cost" of any downtime. By default, Pacemaker assumes there is zero cost associated with moving resources and will do so to achieve "optimal"  resource placement. We can specify a different stickiness for every resource, but it is often sufficient to change the default. Pacemaker’s definition of optimal may not always agree with that of a human’s. The order in which Pacemaker processes lists of resources and nodes creates implicit preferences in situations where the administrator has not explicitly specified them. Now that we have a basic but functional active/passive two-node cluster, we’re ready to add some real services. We’re going to start with Apache HTTP Server because it is a feature of many clusters and relatively simple to configure. Before continuing, we need to make sure Apache is installed on both hosts. We also need the wget tool in order for the cluster to be able to check the status of the Apache server. Do not enable the httpd service. Services that are intended to be managed via the cluster software should never be managed by the OS. It is often useful, however, to manually start the service, verify that it works, then stop it again, before adding it to the cluster. This allows you to resolve any non-cluster-related problems before continuing. Since this is a simple example, we’ll skip that step here. If you are using a different operating system, server-status may already be enabled or may be configurable in a different location. If you are using a version of Apache HTTP Server less than 2.4, the syntax will be different. At this point, Apache is ready to go, and all that needs to be done is to add it to the cluster. Let’s call the resource WebSite. We need to use an OCF resource script called apache in the heartbeat namespace. The script’s only required parameter is the path to the main Apache configuration file, and we’ll tell the cluster to check once a minute that Apache is still running. By default, the operation timeout for all resources' start, stop, and monitor operations is 20 seconds. In many cases, this timeout period is less than a particular resource’s advised timeout period. For the purposes of this tutorial, we will adjust the global operation timeout default to 240 seconds. In a production cluster, it is usually better to adjust each resource’s start, stop, and monitor timeouts to values that are appropriate to the behavior observed in your environment, rather than adjust the global default. After a short delay, we should see the cluster start Apache. Wait a moment, the WebSite resource isn’t running on the same host as our IP address! If you see Not Found or Forbidden in the output, then this is likely the problem. Ensure that the <Location /server-status> block is correct. To reduce the load on any one machine, Pacemaker will generally try to spread the configured resources across the cluster nodes. However, we can tell the cluster that two resources are related and need to run on the same host (or not at all). Here, we instruct the cluster that WebSite can only run on the host that ClusterIP is active on. To achieve this, we use a colocation constraint that indicates it is mandatory for WebSite to run on the same node as ClusterIP. The "mandatory" part of the colocation constraint is indicated by using a score of INFINITY. The INFINITY score also means that if ClusterIP is not active anywhere, WebSite will not be permitted to run. If ClusterIP is not active anywhere, WebSite will not be permitted to run anywhere. Colocation constraints are "directional", in that they imply certain things about the order in which the two resources will have a location chosen. In this case, we’re saying that WebSite needs to be placed on the same machine as ClusterIP, which implies that the cluster must know the location of ClusterIP before choosing a location for WebSite. Like many services, Apache can be configured to bind to specific IP addresses on a host or to the wildcard IP address. If Apache binds to the wildcard, it doesn’t matter whether an IP address is added before or after Apache starts; Apache will respond on that IP just the same. However, if Apache binds only to certain IP address(es), the order matters: If the address is added after Apache starts, Apache won’t respond on that address. To be sure our WebSite responds regardless of Apache’s address configuration, we need to make sure ClusterIP not only runs on the same node, but starts before WebSite. A colocation constraint only ensures the resources run together, not the order in which they are started and stopped. We do this by adding an ordering constraint. By default, all order constraints are mandatory, which means that the recovery of ClusterIP will also trigger the recovery of WebSite. Pacemaker does not rely on any sort of hardware symmetry between nodes, so it may well be that one machine is more powerful than the other. In such cases, you may want to host the resources on the more powerful node when it is available, to have the best performance — or you may want to host the resources on the less powerful node when it’s available, so you don’t have to worry about whether you can handle the load after a failover. To do this, we create a location constraint. In the location constraint below, we are saying the WebSite resource prefers the node pcmk-1 with a score of 50. Here, the score indicates how strongly we’d like the resource to run at this location. Wait a minute, the resources are still on pcmk-2! Even though WebSite now prefers to run on pcmk-1, that preference is (intentionally) less than the resource stickiness (how much we preferred not to have unnecessary downtime). To see the current placement scores, you can use a tool called crm_simulate. There are always times when an administrator needs to override the cluster and force resources to move to a specific location. In this example, we will force the WebSite to move to pcmk-1. We will use the pcs resource move command to create a temporary constraint with a score of INFINITY. While we could update our existing constraint, using move allows to easily get rid of the temporary constraint later. If desired, we could even give a lifetime for the constraint, so it would expire automatically — but we don’t that in this example. Once we’ve finished whatever activity required us to move the resources to pcmk-1 (in our case nothing), we can then allow the cluster to resume normal operation by removing the new constraint. Due to our first location constraint and our default stickiness, the resources will remain on pcmk-1. We will use the pcs resource clear command, which removes all temporary constraints previously created by pcs resource move or pcs resource ban. Note that the INFINITY location constraint is now gone. If we check the cluster status, we can also see that (as expected) the resources are still active on pcmk-1. To remove the constraint with the score of 50, we would first get the constraint’s ID using pcs constraint --full, then remove it with pcs constraint remove and the ID. We won’t show those steps here, but feel free to try it on your own, with the help of the pcs man page if necessary. Even if you’re serving up static websites, having to manually synchronize the contents of that website to all the machines in the cluster is not ideal. For dynamic websites, such as a wiki, it’s not even an option. Not everyone care afford network-attached storage, but somehow the data needs to be kept in sync. DRBD itself is included in the upstream kernel, but we do need some utilities to use it effectively. CentOS does not ship these utilities, so we need to enable a third-party repository to get them. Supported packages for many OSes are available from DRBD’s maker LINBIT, but here we’ll use the free ELRepo repository. In this example, we have only two nodes, and all network traffic is on the same LAN. In production, it is recommended to use a dedicated, isolated network for cluster-related traffic, so the firewall configuration would likely be different; one approach would be to add the dedicated network interfaces to the trusted zone. DRBD will need its own block device on each node. This can be a physical disk partition or logical volume, of whatever size you need for your data. For this document, we will use a 512MiB logical volume, which is more than sufficient for a single HTML file and (later) GFS2 metadata. Edit the file to use the hostnames, IP addresses and logical volume paths of your nodes if they differ from the ones used in this guide. Detailed information on the directives used in this configuration (and other alternatives) is available in the DRBD User’s Guide. The allow-two-primaries option would not normally be used in an active/passive cluster. We are adding it here for the convenience of changing to an active/active cluster later. With the configuration in place, we can now get DRBD running. Because we have not yet initialized the data, this node’s data is marked as Inconsistent. Because we have not yet initialized the second node, the local state is WFConnection (waiting for connection), and the partner node’s status is marked as Unknown. You can see the state has changed to Connected, meaning the two DRBD nodes are communicating properly, and both nodes are in Secondary role with Inconsistent data. If you are using a different version of DRBD, the required syntax may be different. See the documentation for your version for how to perform these commands. We can see that this node has the Primary role, the partner node has the Secondary role, this node’s data is now considered UpToDate, the partner node’s data is still Inconsistent, and a progress bar shows how far along the partner node is in synchronizing the data. Both sets of data are now UpToDate, and we can proceed to creating and populating a filesystem for our WebSite resource’s documents. In this example, we create an xfs filesystem with no special options. In a production environment, you should choose a filesystem type and options that are suitable for your application. One handy feature pcs has is the ability to queue up several changes into a file and commit those changes all at once. To do this, start by populating the file with the current raw XML config from the CIB. Using pcs’s -f option, make changes to the configuration saved in the drbd_cfg file. These changes will not be seen by the cluster until the drbd_cfg file is pushed into the live cluster’s CIB later. Here, we create a cluster resource for the DRBD device, and an additional clone resource to allow the resource to run on both nodes at the same time. After you are satisfied with all the changes, you can commit them all at once by pushing the drbd_cfg file into the live CIB. We can see that WebDataClone (our DRBD device) is running as master (DRBD’s primary role) on pcmk-1 and slave (DRBD’s secondary role) on pcmk-2. Now that we have a working DRBD device, we need to mount its filesystem. In addition to defining the filesystem, we also need to tell the cluster where it can be located (only on the DRBD Primary) and when it is allowed to start (after the Primary was promoted). We are going to take a shortcut when creating the resource this time. Instead of explicitly saying we want the ocf:heartbeat:Filesystem script, we are only going to ask for Filesystem. We can do this because we know there is only one resource script named Filesystem available to pacemaker, and that pcs is smart enough to fill in the ocf:heartbeat: portion for us correctly in the configuration. If there were multiple Filesystem scripts from different OCF providers, we would need to specify the exact one we wanted. Once again, we will queue our changes to a file and then push the new configuration to the cluster as the final step. We also need to tell the cluster that Apache needs to run on the same machine as the filesystem and that it must be active before Apache can start. After reviewing the new configuration, upload it and watch the cluster put it into effect. Previously, we used pcs cluster stop pcmk-1 to stop all cluster services on pcmk-1, failing over the cluster resources, but there is another way to safely simulate node failure. We can put the node into standby mode. Nodes in this state continue to run corosync and pacemaker but are not allowed to run resources. Any resources found active there will be moved elsewhere. This feature can be particularly useful when performing system administration tasks such as updating packages used by cluster resources. Put the active node into standby mode, and observe the cluster move all the resources to the other node. The node’s status will change to indicate that it can no longer host resources, and eventually all the resources will move. Once we’ve done everything we needed to on pcmk-1 (in this case nothing, we just wanted to see the resources move), we can allow the node to be a full cluster member again. Notice that pcmk-1 is back to the Online state, and that the cluster resources stay where they are due to our resource stickiness settings configured earlier. STONITH (Shoot The Other Node In The Head aka. fencing) protects your data from being corrupted by rogue nodes or unintended concurrent access. Just because a node is unresponsive doesn’t mean it has stopped accessing your data. The only way to be 100% sure that your data is safe, is to use STONITH to ensure that the node is truly offline before allowing the data to be accessed from another node. It is crucial that your STONITH device can allow the cluster to differentiate between a node failure and a network failure. A common mistake people make when choosing a STONITH device is to use a remote power switch (such as many on-board IPMI controllers) that shares power with the node it controls. If the power fails in such a case, the cluster cannot be sure whether the node is really offline, or active and suffering from a network fault, so the cluster will stop all resources to avoid a possible split-brain situation. Likewise, any device that relies on the machine being active (such as SSH-based "devices" sometimes used during testing) is inappropriate. Install the STONITH agent(s). To see what packages are available, run yum search fence-. Be sure to install the package(s) on all cluster nodes. Configure the STONITH device itself to be able to fence your nodes and accept fencing requests. This includes any necessary configuration on the device and on the nodes, and any firewall or SELinux changes needed. Test the communication between the device and your nodes. Any flags that do not take arguments, such as --ssl, should be passed as ssl=1. If the device does not know how to fence nodes based on their uname, you may also need to set the special pcmk_host_map parameter. See man pacemaker-fenced for details. If the device does not support the list command, you may also need to set the special pcmk_host_list and/or pcmk_host_check parameters. See man pacemaker-fenced for details. If the device does not expect the victim to be specified with the port parameter, you may also need to set the special pcmk_host_argument parameter. See man pacemaker-fenced for details. Step 1: Install the fence-agents-ipmilan package on both nodes. 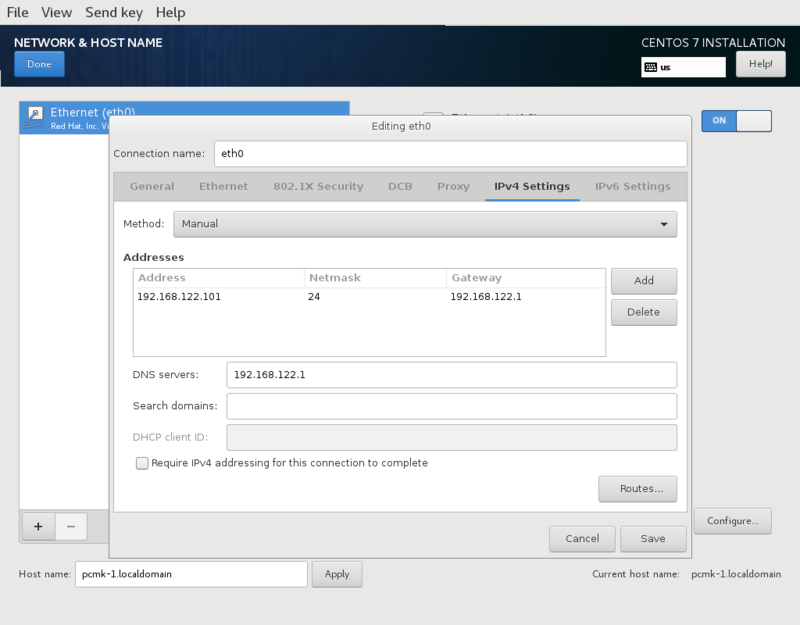 Step 2: Configure the IP address, authentication credentials, etc. in the IPMI device itself. Step 3: Choose the fence_ipmilan STONITH agent. fence_ipmilan is an I/O Fencing agentwhich can be used with machines controlled by IPMI.This agent calls support software ipmitool (http://ipmitool.sf.net/). WARNING! This fence agent might report success before the node is powered off. You should use -m/method onoff if your fence device works correctly with that option. auth: IPMI Lan Auth type. sudo: Use sudo (without password) when calling 3rd party sotfware. priority: The priority of the stonith resource. Devices are tried in order of highest priority to lowest. pcmk_host_list: A list of machines controlled by this device (Optional unless pcmk_host_check=static-list). random delay for stonith actions. The overall delay is derived from this random delay value adding a static delay so that the sum is kept below the maximum delay. a static delay for stonith actions. The overall delay is derived from a random delay value adding this static delay so that the sum is kept below the maximum delay. specify the maximum number of actions can be performed in parallel on this device. -1 is unlimited. After a successful test, login to any rebooted nodes, and start the cluster (with pcs cluster start). The primary requirement for an Active/Active cluster is that the data required for your services is available, simultaneously, on both machines. Pacemaker makes no requirement on how this is achieved; you could use a SAN if you had one available, but since DRBD supports multiple Primaries, we can continue to use it here. The only hitch is that we need to use a cluster-aware filesystem. The one we used earlier with DRBD, xfs, is not one of those. Both OCFS2 and GFS2 are supported; here, we will use GFS2. Before we do anything to the existing partition, we need to make sure it is unmounted. We do this by telling the cluster to stop the WebFS resource. This will ensure that other resources (in our case, Apache) using WebFS are not only stopped, but stopped in the correct order. You can see that both Apache and WebFS have been stopped, and that pcmk-1 is the current master for the DRBD device. Now we can create a new GFS2 filesystem on the DRBD device. This will erase all previous content stored on the DRBD device. Ensure you have a copy of any important data. -p lock_dlm specifies that we want to use the kernel’s DLM. -j 2 indicates that the filesystem should reserve enough space for two journals (one for each node that will access the filesystem). -t mycluster:web specifies the lock table name. The format for this field is clustername:fsname. For clustername, we need to use the same value we specified originally with pcs cluster setup --name (which is also the value of cluster_name in /etc/corosync/corosync.conf). If you are unsure what your cluster name is, you can look in /etc/corosync/corosync.conf or execute the command pcs cluster corosync pcmk-1 | grep cluster_name. Now we can (re-)populate the new filesystem with data (web pages). We’ll create yet another variation on our home page. With the WebFS resource stopped, let’s update the configuration. The fstype option needs to be updated to gfs2 instead of xfs. There’s no point making the services active on both locations if we can’t reach them both, so let’s clone the IP address. The IPaddr2 resource agent has built-in intelligence for when it is configured as a clone. It will utilize a multicast MAC address to have the local switch send the relevant packets to all nodes in the cluster, together with iptables clusterip rules on the nodes so that any given packet will be grabbed by exactly one node. This will give us a simple but effective form of load-balancing requests between our two nodes. clone-max=2 tells the resource agent to split packets this many ways. This should equal the number of nodes that can host the IP. clone-node-max=2 says that one node can run up to 2 instances of the clone. This should also equal the number of nodes that can host the IP, so that if any node goes down, another node can take over the failed node’s "request bucket". Otherwise, requests intended for the failed node would be discarded. globally-unique=true tells the cluster that one clone isn’t identical to another (each handles a different "bucket"). This also tells the resource agent to insert iptables rules so each host only processes packets in its bucket(s). Notice that when the ClusterIP becomes a clone, the constraints referencing ClusterIP now reference the clone. This is done automatically by pcs. Now we must tell the resource how to decide which requests are processed by which hosts. To do this, we specify the clusterip_hash parameter. The value of sourceip means that the source IP address of incoming packets will be hashed; each node will process a certain range of hashes. Load our configuration to the cluster, and see how it responds. If desired, you can demonstrate that all request buckets are working by using a tool such as arping from several source hosts to see which host responds to each. Now that we have a cluster filesystem ready to go, and our nodes can load-balance requests to a shared IP address, we can configure the cluster so both nodes mount the filesystem and respond to web requests. Clone the filesystem and Apache resources in a new configuration. Notice how pcs automatically updates the relevant constraints again. Tell the cluster that it is now allowed to promote both instances to be DRBD Primary (aka. master). Finally, load our configuration to the cluster, and re-enable the WebFS resource (which we disabled earlier). After all the processes are started, the status should look similar to this. Testing failover is left as an exercise for the reader. For example, you can put one node into standby mode, use pcs status to confirm that its ClusterIP clone was moved to the other node, and use arping to verify that packets are not being lost from any source host. Attributes: ipaddr="10.0.0.1" login="testuser" passwd="acd123" pcmk_host_list="pcmk-1 pcmk-2"
Users of the services provided by the cluster require an unchanging address with which to access it. Additionally, we cloned the address so it will be active on both nodes. An iptables rule (created as part of the resource agent) is used to ensure that each request only gets processed by one of the two clone instances. The additional meta options tell the cluster that we want two instances of the clone (one "request bucket" for each node) and that if one node fails, then the remaining node should hold both. Here, we define the DRBD service and specify which DRBD resource (from /etc/drbd.d/*.res) it should manage. We make it a master clone resource and, in order to have an active/active setup, allow both instances to be promoted to master at the same time. We also set the notify option so that the cluster will tell DRBD agent when its peer changes state. The cluster filesystem ensures that files are read and written correctly. We need to specify the block device (provided by DRBD), where we want it mounted and that we are using GFS2. Again, it is a clone because it is intended to be active on both nodes. The additional constraints ensure that it can only be started on nodes with active DLM and DRBD instances. Lastly, we have the actual service, Apache. We need only tell the cluster where to find its main configuration file and restrict it to running on nodes that have the required filesystem mounted and the IP address active. Sample corosync.conf for two-node cluster created by pcs. contact information for this manual, We Need Feedback!